As a podcaster, I've long since grown used to the idea of periodically issuing audio content. But the convenient recording, internet, and computer, and mobile listening technologies that made such a medium possible only really converged in the early 2000s. How would I have gone about it had I wanted to put out a "podcast," say, 40 years earlier? 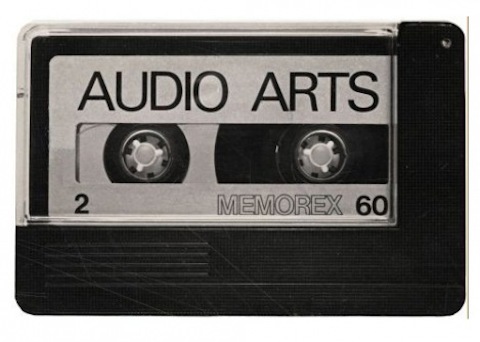 We have one such example in Audio Arts, a British contemporary art "sound magazine" distributed through the mail on audio cassettes. "The seventies were the years of conceptual art with text adding value to the actual works," co-creator William Furlong once said in an interview. "As an artist I was more interested in 'discussion,' the idea of language and the people that already worked in conceptual fields in Great Britain. Soon I realised there weren’t magazines capable of reporting such material inspired by conversation, sounds and discussions. The evocative force of a voice is lost with the written word as it will only ever be a written voice." Furlong, a sculptor, and Barry Barker, a gallerist, began publishing Audio Arts in 1973. Its run lasted until, astonishingly, 2006, by which time its archives had come to 25 volumes of four issues each. Its list of subscribers included the formidable Tate, such fans that they actually acquired the magazine's master tapes, digitized them, and made them all publicly available on their web site. No longer must you seek out nth-generation duplicated analog cassettes and dig out your Walkman; now you can simply stream on your media player of choice every issue from January 1973, "four cassettes with contributions from Caroline Tisdall, Noam Chomsky, James Joyce and W.B. Yeats," to January 2006, which caps everything off with contributions by Gilbert & George and Jake and Dinos Chapman. Other notable artistic presences include Marcel Duchamp in Volume 2, Philip Glass in Volume 6, and Andy Warhol in Volume 8. Helpfully, Tate has also put together a section with tools to explore Audio Arts' highlights — something more than a few modern-day podcasts could no doubt use. Thanks for the article and links!